God blessed us with 6.85 inches of rain which should be a record for August for central Texas. It will help the pastures & hayfields. The corn & cotton crops will have mostly low yields. There are very few crops in West TX other than what is irrigated. 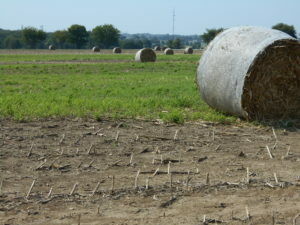 Hay is in short supply because of the drought. Farmers & ranchers and those in agriculture are forced with little or no income after working hard all year. When we think things are not going very well, we can remember what Carrie Ten Boom said in the German Concentration camp. She stated, “we need to praise God for all things”. We need to pray that God will give us faith to praise Him in all circumstances. We had a great FCAI program at Conference & Show. Martin Higgenbotham from Florida gave the program & Denny Stouffer of Maryland presented the praise music. FCAI officers elected from Texas were Amy Assiter, Alvin Kaddatz, Lisa Gay, John Gay, Traci Yeaman, Spanky Assiter, & John Sisk. Corn hay baled because of drought. Doreen Bohrer (Krista Richter’s mother) Wimberley, TX. Angela (Daughter), Dan (Son-in-law), and Abigail Masullo (granddaughter) Rick Montgomery’s family Arlington, TX. Garland Lee Kelley Sr. (Kyle Dyke’s Grandfather), Killeen, TX. If you have a soldier deployed overseas, let us know. We send out care packages to them. We have 3 we are sending packages to. If you would like to be on the FCAI email list, send your e-mail address. Check our website or Facebook for praise reports, prayer request, thank you notes and obituaries. You can send contributions to FCAI, visit our website, or call 254-582-3000 with a credit card. Our address is: 535 HCR 4223, Hillsboro, Texas 76645. For online donations please visit: www.fcai.org.